SWITZERLAND, Zurich — Based on breaking news and events, it appears that the CIA in Switzerland will attempt to stage a false-flag attack on Obama when he appears for the final time on the Daily Show with Jon Stewart on July 21, 2015. Exactly what type of attack is planned for Obama is not known, but it will most likely involve some liquid or bio-chemical-related attack by a member of the audience. Said attack will predictably be committed and blamed on a white racist Obama-hating gun-owning American. In order to highlight race and racism just prior to a race war terror attack or assassination attempt on Obama’s person, it was reported on June 22, 2015, that President Obama used the N-word in a podcast, stating that America is “not cured” of racism. In other words, race war attacks are now in play. In the event that Obama is attacked, it will likely be reported that he died, only to reappear injured or unscathed at a later date. This will be seen as the death and resurrection of Obama who, politically speaking, has been on life support for some time. 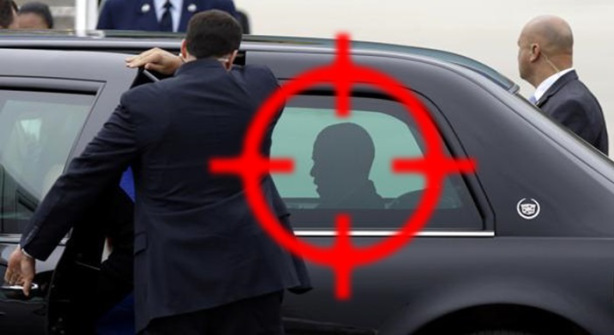 An elaborate assassination “event” will do the same for Barack Obamas as it did for one Adolf Hitler. Back on July 20, 1944, Hitler was targeted in an unsuccessful bombing, resulting in 5,000 executions and 7,000 arrests. In the wake of an Obama assassination “event”, the attack will be used as an excuse to round up “disloyal” Americans in the U.S. government, bringing about the naked dictatorship of Obama. Prior to a high-profile liquid-related terror attack on a politician, the world must be psychologically prepared to accept that this is in fact possible. Fraudulent headlines and fabricated events are a slick way of convincing people that yes, it can happen. As evidenced, liquid-related terror is now at an all-time high which suggests that a state-sponsored terror attack using liquid (possibly bio-chemical in nature) is imminent.